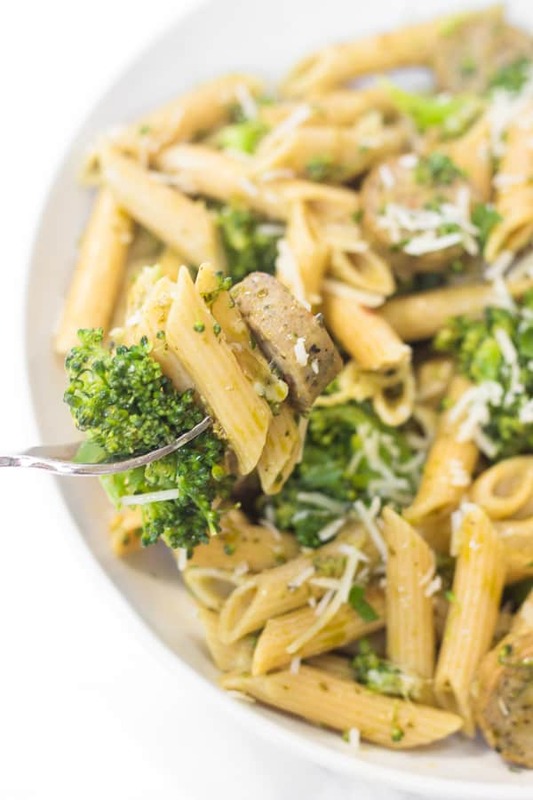 This broccoli pesto penne is an easy 25-minute one-pot dinner, sponsored by Barilla! Thanks for supporting the brands that keep Healthy Liv up and running. As I started writing this post, I started having major cravings for this pasta all over again! I’m actually typing this up in D.C., where I had a conference for one of my campus organizations this weekend. Traveling is so fun, but I do always miss cooking and having homemade meals. For this recipe, I used Barilla ProteinPLUS pasta. It has 17 grams of protein in just 3.5 ounce serving, and the protein comes from chickpeas, lentils, and egg whites. 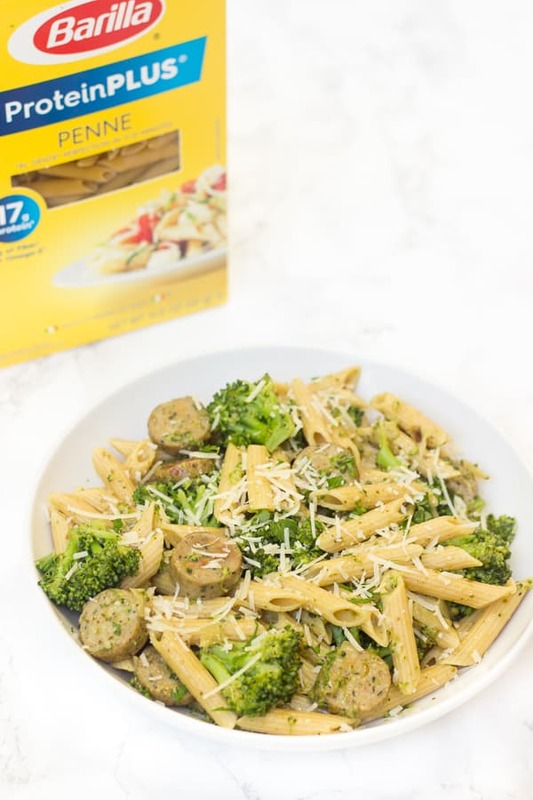 I was a little apprehensive the first time I tried it because I thought the extra protein might change the taste or texture, but it really does taste just like any other pasta I’ve had! And the extra protein is great fuel for an active lifestyle! For this pasta recipe, I save steps and dishes by using only one pan. 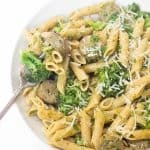 You can actually cook the broccoli right along with the pasta! I just add the broccoli during the final three minutes or so of the pasta’s cooking time. 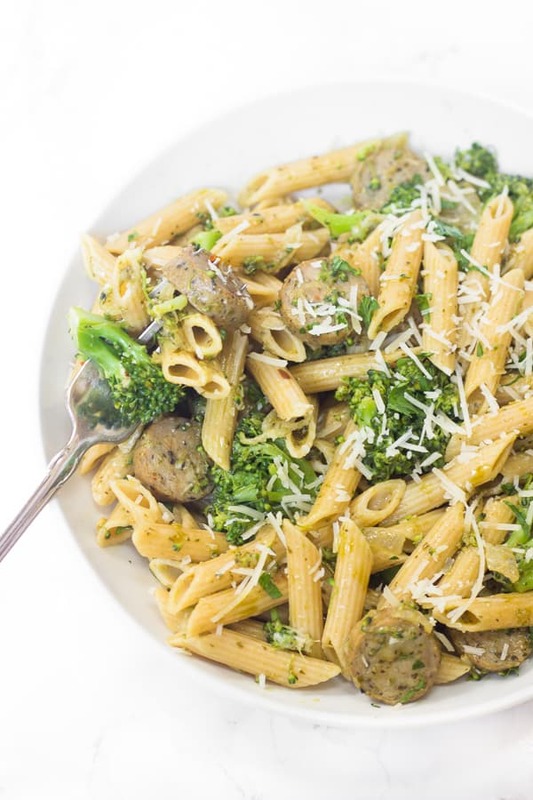 It’s a little bit of a balancing act to cook both the pasta and broccoli perfectly, but the most important thing is to not let the pasta get overcooked. I can handle cooking in the dorm kitchen, but I really try to avoid having to wash many dishes. Because if anything needs to soak, I have to fill it with water and leave it in the shared kitchen for an hour or two (oops) or lug it back to my room. So, I made this broccoli pesto penne a one-pot meal to minimize dish-washing as much as possible. And if you try this broccoli pesto penne, feel free to take a picture and tag me @livbane on Instagram or let me know in a comment! Chop the broccoli into small florets while bringing a pot of water to boil. Add the pasta to the boiling water and first cook the pasta 3 minutes less than the lowest cooking time listed on the package. For example, if the package says to cook the pasta for 8-10 minutes, set a timer for five minutes. At the five minute mark, add the chopped broccoli florets to the boiling water and cook for three more minutes, until both pasta and broccoli are cooked. Be careful not to overcook pasta. Reserve half a cup of the pasta water, then drain pasta and broccoli into a colander and set aside. Return the pan to the stove on medium heat. Add 1 tablespoon of olive oil to the pan, and then add sliced chicken sausage, chopped onions, and minced garlic. Cook until the chicken sausage is slightly browned and onions are soft, about 5-7 minutes. 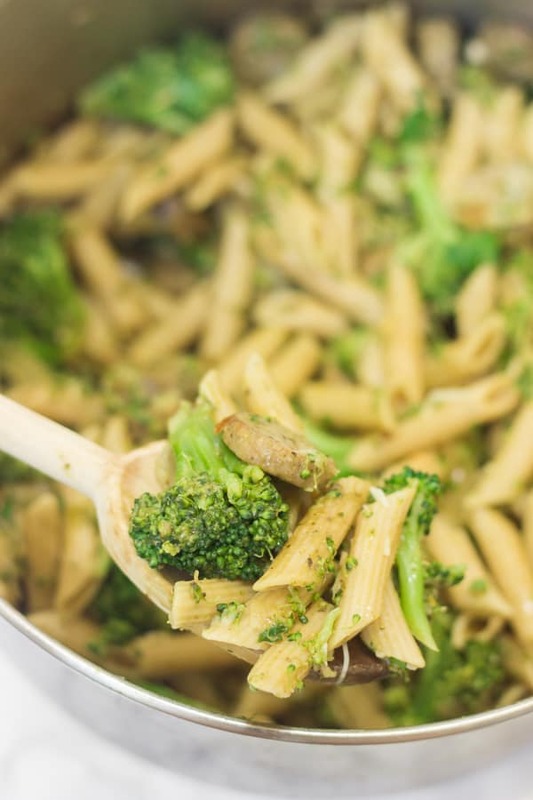 Return pasta and broccoli to the pan, add pesto and parmesan cheese, and stir to combine. Add reserved pasta cooking water if needed and then serve immediately. So tell me…what are your favorite pasta dishes lately? 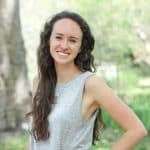 Feel free to link drop and share recipes! This recipe is a keeper! Simple and delicious! Trader Joe’s carries a really good chicken sausage and pesto. I agree, I love Trader Joe’s chicken sausage and pesto both! I love making pasta and adding veggies with pesto! I’ve never thought to add sausage so I’ll try that next time. It’s a super easy way to add some extra protein! I love not having a lot of dishes to wash, so this recipe is great! So simple, tasty, and nutritious! Also looks really easy to put together. Like, easy enough that even I can do it…. thanks! Oh, I hope you love this pasta!! It’s easy and delish! Mmm, I loveee pesto pasta and this looks perfect! So simple and so delicious! Simple, easy-to-follow yet delicious recipe. Both my kids love pesto pasta, can’t wait to give this a try. Thanks, Bonnie! Hope you and your kids love it!! One pot pasta meals are one of my very favorite kinds of meals! It’s SOOO delicious to make a quick pasta dish for the family. Thanks a lot for sharing such a fantastic recipe. Looks perfect delicious. I really like to appreciate. I have never made it before, as it seems like a large and daunting task, but I am going to go ahead and get some and try it out now!